I was, apparently, born in the same town and went to the same school as Illustrator Quentin Blake, most famous for his wonderfully apparently effortless illustrations for the books of Roald Dahl; although obviously not at the same time… what with him being 43 years my senior. Anyway, I managed to spot an interview him on BBC Breakfast News before I left for work this morning where he was talking about a proposed museum for illustration in London. 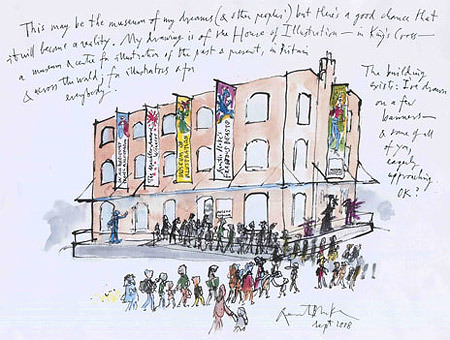 They’re currently trying to raise the £6 million required to build a “House of Illustration” in Kings Cross, London by 2011 — the world’s first museum dedicated to the art of illustration in all its forms. The House of Illustration is a registered charity that was established in 2002. It is the brainchild of Quentin Blake. As an experienced illustrator and teacher, he saw a gap in the UK’s museum sector. At the moment, illustration is only seen in occasional temporary exhibitions in other museums and galleries. The House of Illustration will change that. The House of Illustration will be the place to see past and present illustration, both British and international. It will be the world’s first centre dedicated to the art of illustration in all its forms. They are a registered charity and currently accepting donations via their website.